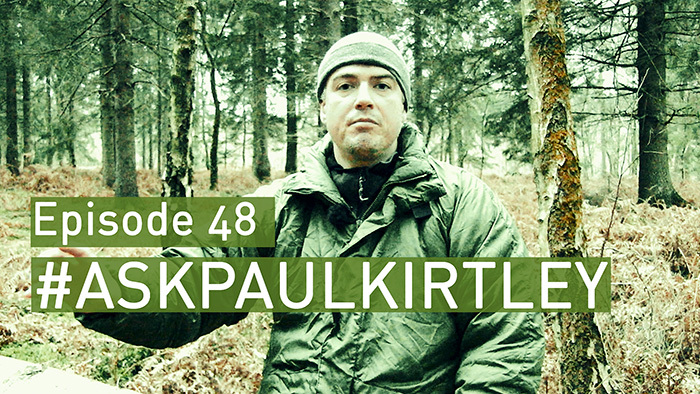 another great episode of ask paul kirtley,thanks for taking time out and making these paul.A free bit of knowledge from someone as yourself who spends alot of their days outside and in the feild of bushcraft is worth its weight in gold to others who are just starting their journey into such a great subject. Thanks Danny. I’m super glad these are helpful to you and others. That’s all the motivation I need to keep making them (as well as creating the articles and other material on this site). To anyone wishing to get a career in bushcraft instruction, I would recommend they purchase Mors Kochanski’s book “Grand Syllabus” which. although he deals with survival and bushcraft instruction, it is humbling to determine how inadequate we really might be compared to what Mors considers instructor material to be. There is much involved, and if it’s about money, then it’s not a career to get into. As for your dream of an IT person to provide you a way to catalogue your Ask Paul Kirtley episodes, maybe going old school would help? By this, I mean would you allow someone to simply alphabetically log every episode with the Q and A’s and put these on a separate page so anyone could have a table of contents to refer to? I am not sure if a cut and paste approach would do if these could be tabulated on say, Microsoft Word, then copied and pasted onto your web page? Seems to me you are short on time to this your self. You just need someone to catalogue these for you. Very good answers for all the questions. Good to hear from you. Yes, I’d agree that Mors’s Grand Syllabus is well worth using as a framework for aspiring instructors, particularly those in the cooler parts of the Northern Hemisphere. As for the tabulation and listing of questions – it’s a good idea and we could do it but the list would have to be dynamic. I am, are every week or two, adding a new episode. So the list would need to be updated on a regular basis. Hence my thought about somehow running a search engine over the questions/answers. At present I can’t afford to have previous episodes fully transcribed (it costs about $1 per minute for good quality transcription) but by adding text of the questions to the episodes, I wonder if the regular site search engine would be sufficient to pick up the relevant episodes if someone typed in a similar question? As always Buck, thanks for your thoughts and feedback. Hi Paul another good episode. Instructing, most things I have enjoyed doing I have ended up enjoying teaching to others. I had a shock with scuba diving. For a while I loved it and considered moving to a career teaching Scuba diving. I got qualified as an instructor and worked, part time teaching. I found that by teaching Scuba I lost my love for the hobby. One option for finding out if you enjoy teaching outdoor skills would be to join Scouts or Cadets who all use some of the skills and are always looking for keen instructors. Bivvy bags, I first used a gortex bivvy bag back in the eighties, when they were first used, and have had one ever since. If I’m sleeping without a tarp I will drive a steak into the ground by my head. This is so that, if it begins to rain, I can drape my coat over the stake covering the area around my head. I have also used an umbrella in a similar way. I have also messed things up by diving deep into the bivvy and suffering from the moisture from my own breath. Thanks again for another great episode. Nice to see the deer wandering in the background (around 13mins). Roe I assume? Thanks for the information. it’s always very helpful. Hi Paul, thanks for another interesting and instructive episode. With reference to the instruction certification, I agree that just being good at doing something yourself will not in itself make someone a good teacher of others. As you said there are various ways that different people find easiest to learn from. Reading how it should be done, with diagrams, then trying on their own, is for some, their favourite way. Being physically shown, then trying themselves, while the teacher watches/corrects, is for others their preferred way. Unless you can tune in to the students` personal learning preferences, you will never be a well rounded teacher. Of course the instructor has to exude their own passion for the subject, and enjoy teaching it. I thought about the possiblity of a jacket roof too, because on some travels I have to use a rainjacket and cant use a poncho (the reason comes from my job, where I cant use the military poncho, what is of course the better option for normal hikes). I will try to create a genious jacket tent construction, a gear the world is waiting for! If I get a result, I’ll send you pictures! Of course a thick mat and a warm sleeping bag with tarp or military poncho works in the most conditions, that’s obvious. But my problem is, that I often have to carry about 7 kilogram of concert posters with me, I agree, that is not the outfit, most bushcrafters take with them in the forest, but I do it, that’s my job! So I have to lighten the load for the camping equipment. I bought a nice 750 ml toaks titanium pot with pot hanger (not used till now) a petzl e-light and a photon mini light as backup, an EOE titanium gas burner (doesn’t work with optimus gas bottles, by the way, because they are bad constructed) a Decathlon plastic spoon and try to get hotel soap envellopes and so on. So my question went on tough but ULTRALIGHT bushcraft equipment, what means NOT ultra thin materials, that last 4 weeks of use, but ultra small titanium, aluminum and plastic gear. That was the reason of my question. But I just decided, that the zipp offers the option between use of the bivi as ground sheed in 30*C conditions and normal use inside. I think, that option of an open bivi in hot but instable weather conditions is interesting. So I just bought the bivi with the zipp. If I should become whet next summer, because water came through the zipp, this solution gives me the option, not to call myself an idiot, because I let my poncho at home, no I can become angry with the team of Snugpack and Mr. Kirtley on top, because he didn’t warn me. And to have some body else, who would be guilty if I misuse my equipment is a phantastic oportunity, that convinced me in the end. But for the moment: Thank you for your opinion and warm regards! I controlled the weight of my foldable german army insulation matress. It is only 370 g.
Do you use air mats in sub minus celsius conditions, Paul? Most people have fear about ice inside and fear about loosing air if they are out for playing in the snow. Ok, if the question is “me or that christmas tree?” I cut down a branch or even half a tree, i think, that would help. But i think a closed cell foam mat is most times the better option, uncomfortable but sure. Or am I wrong? Ok, now I am leaving the summer conditions, but i do not agree so much with your horses for corses ideas. I prefere absoloutly your modular system idea. I use the same equipment every where , just adding special equipment for special use on top. A reason, why I bought the Snugpack Special forces System (SF 1 , SF 2, SF bivi) not cheap, but it goes down to – 20*C, one sleeping bag system for all use in all weather in Germany, not light, but not to heavy and so long you do not want to run on top of the Zugspitze or Montblanc it is light enough. Winter and light doesnt go together, never! As someone who uses both the snugpack SF bivi and a expeed winterlight 7 air mattress I should warn you that they do not work well together. Each is a great bit of kit and I am very happy with them but, I find, they do not work well together. The mat is too thick and the bivi too small to work together. I put the mat in the bag and find that my sleeping bag is very tight against the bivi and not able to loft properly, even with a summer sleeping bag. I’m 5 foot 8 and weigh 11.5 stone so not big. The mat works great in a tent or bigger bivi. The expeed mats use either a built-in hand pump or an external bag to inflate, I have never had any problems with moisture in the mat and mine is full of down. There are a number of lightweight tarps available now (Paul could tell you more as I got the idea from him). I now carry one whenever I go out. It lives in a pocket. And I recommend: Ernst Juenger: In Stahlgewittern. Seriously! We have to pay attention!